Two young men meet on a train in 1917. Miles is out of the hospital in time for Christmas, traveling to relatives he doesn't want to see. He was lucky to survive the Great War. But he doesn't feel very lucky right now. 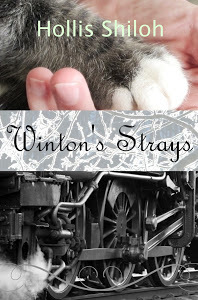 Until blue-eyed Winton trips on a scarf and into his life. Winton, with his quirky smile, gentle nature, and rescued pets. Miles could love this man, he really could. But how the hell can he burden this kind, bright young man with his wounded, limping self? A sweet, historical M/M romance / gay romance. “Yes, but--” He cast Miles a startled look. “Cold. You are cold, aren't you? And you just got out of the hospital.” He made an annoyed sound in his throat and halted. “I’m sorry. Here.” He put down his suitcase and retrieved the gigantic blue scarf from his bulging coat pocket. “You’ll choke me,” warned Miles, grinning. “I won't.” Winton wound the long, thick scarf around Miles’s neck, his fingers gentle, his slender face close. Close enough to kiss, if things were just a bit different: if this place were less exposed, if they’d known each other longer, if he was sure. Miles's mouth tingled, but he kept his hands firmly by his side, his mouth to himself. Win's fingers were careful and light as he fixed the scarf. At length, he drew away with almost a caress, and smiled, his gaze warm and full. “It looks better on you.” He took Miles's arm again, and they fell into step.